We live in a world that is divided between ideological poles: Left and right, liberal and conservative, red states and blue states. This dynamic plays out not only in popular culture, but also within the Church. Our congregations endure vicious arguments over hot button issues like gay marriage, the ministry of women and abortion – yet both sides in these debates lack a compelling and positive vision of what the Church is called to be. Both extreme liberals and extreme conservatives are more interested in ideological purity than in building up the Body of Christ and seeing real, practical changes in the way that we live as a community. If this were not so, we would spend less time on theological debates (important as these are) and much more time on outreach and service to our neighbors. The most profound division in our society is not between left and right. Rather, it is between those who want to preserve the status quo and those who seek radical change in the way we live and see the world. Despite appearances to the contrary, both sides in the culture wars are wedded to a fearful, uncreative view of the world. While conservatives want to “go back” to an imagined golden age of prosperity, liberals have projected their own prejudices into an utopian future, in which everyone will become as enlightened as they themselves already are. Both camps of culture warriors are stuck in the same place: fighting yesterdays battles, clawing desperately to preserve their own comfort and privilege. But there is an alternative. We do not have to pick a side in this false battle for the heart and soul of our society. Rather than getting caught up in these bipolar disputes, many of us are being called into an engagement with the real problems that confront our culture and our churches today. This is a challenging path. It requires us to recognize how we participate in a world that values wealth and security more than the Truth. Rather than blaming others, we must confess that the ills of our culture stem in our own failure to lead lives of humility, trust and love. Looking within, we must recognize that all the world’s problems are present in microcosmwithin our own hearts. Acknowleding this, we are empowered to humbly work for change in the world, recognizing that we are all responsible. Our call for heart-change within the Church and the wider culture begins with the recognition that we ourselves must be transformed. We know that the culture wars are not from God. These debates are fueled by a smug sense of self-righteousness and superiority more in keeping with the spirit of the Pharisees than with the Spirit of Christ. Any ideology is false that calls for others to change without first confessing our own shortcomings and need for transformation. God calls us to lives of humility, endurance and self sacrifice; and when we live in Christ, we experience love and compassion for others – not a bristling sense of superiority. How can we move beyond the false dichotomies of red versus blue? Is there a third way that we can live into? Is there a way that seeking the truth together could become more important than winning? Opening ourselves to the living presence of God, can we receive the surprising answers that the Spirit will give us? 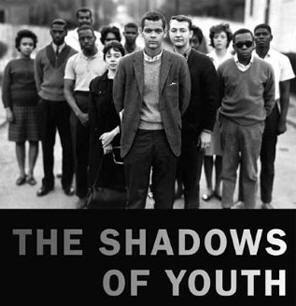 I have drawn a lot of comfort and inspiration recently from reading Andrew Lewis’ book, The Shadows of Youth, about the young activists who were the backbone of the civil rights movement of the 1950s and 1960s. It has been a delight to read about how women and men in their early twenties – like Diane Nash, Stokely Carmichael, Bob Moses, and John Lewis – had the courage to stand up against cruelty and injustice, and in the process helped to shape the character of the United States for decades to come. Despite the gap in generation and historical context, the lives of these daring civil rights activists provide perspective on my involvement with the Occupy movement. I am intrigued about the many similarities that present themselves: the tension between reform and revolution; clashes between the old, pragmatic establishment and the young, idealistic activists; the friendships that hold the movement together; and the personality conflicts that break it apart. There is so much wisdom to be gained from the hard-earned lessons of those who have come before. Reading about the civil rights movement is affecting me many ways. In addition to giving me insight about the nature of grassroots activism in general, it helps to sensitize me to the dynamics of race and class in the United States. Some of the stories told in The Shadows of Youth are so extreme as to be almost unbelievable. 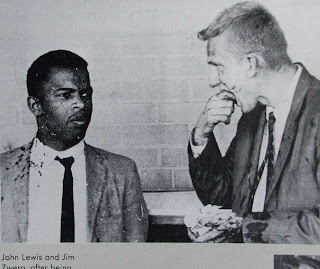 A prime example would be how the Freedom Riders of 1961 were met by violent mobs of white citizens who, with the cooperation of local police, beat these college-aged activists with baseball bats, chains and whips. 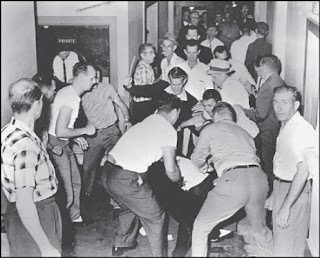 White America was stridently committed to the perpetuation of Jim Crow, and it required great courage by black activists and white allies to be willing to take the insults, beatings, torture and murder that awaited them. The sheer moral power of this guiltless suffering, captured by reporters and broadcast to the nation, had a huge impact on the culture. By the end of the 1960s, de jure segregation was no more, and though the pace of progress was slow, African-Americans were increasingly finding their voice in public discourse and governance. There was real reason for optimism. Yet, as I read about these remarkable historical struggles that changed the face of our nation, I cannot help but notice how far we still fall short of the dream of racial equality and economic justice in this country. Despite the fact that segregation is no longer legally enforced, Washington, DC is deeply divided along racial and class lines. Of course, the strong links between race and economic class only increase the dynamic of de facto segregation. I live in Deanwood, a neighborhood in DC that lies to the east of the Anacostia river. Those who are familiar with DC will know that white folks do not generally venture into this part of the city, known as East of the River. Many here are afraid to even visit my neighborhood, much less live here. On the other hand, since very few of the city’s cafes, supermarkets and shops are located East of the River, we frequently leave our part of town to buy groceries, or meet up with friends. It is a strange sensation to people-watch as I commute from Deanwood to Capitol Hill. As I start out from my home, I am surrounded by my African-American neighbors. Kids returning from school. The man hawking newspapers at Benning Road and East Capitol Street. When I cross the river, the picture changes dramatically. Immediately, there are large numbers of well-dressed professionals and middle class white people. By the time I reach historic Capitol Hill, all I see are white folks jogging, walking their dogs and strolling with their babies. I am in another city entirely. I cannot help but wonder: is this what Lewis, Nash, Carmichael and other civil rights activists thought they were putting their lives on the line for? De facto segregation in the nation’s capital? A city divided by enormous gaps in wealth and privilege, where most of its black residents are consigned to one isolated quarter of the District? Seeing the dynamics at work in my town, I am reminded that the long struggle for racial equality and economic justice is far from over. I wonder how I, as a white man involved in the Occupy movement, can humbly make space for a next step in the liberation of those who are marginalized in our culture and economy. How can I stay aware of the injustice that continues to hold sway in our society? How can I change my own ways of thinking and living in the world, to live into the dream of true peace and reconciliation? 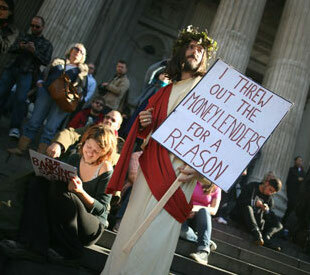 The Occupy movement has been an emotional roller coaster. At first, there was great surprise that this movement was even happening. As we occupied the streets, parks, banks and public buildings, surprise gave way to elation. After all these years of waiting for someone else to take charge and set our country back on track, we were compelled to put our bodies where our hearts were. We stepped into the streets and out of a lost decade of fear, disempowerment and despair. 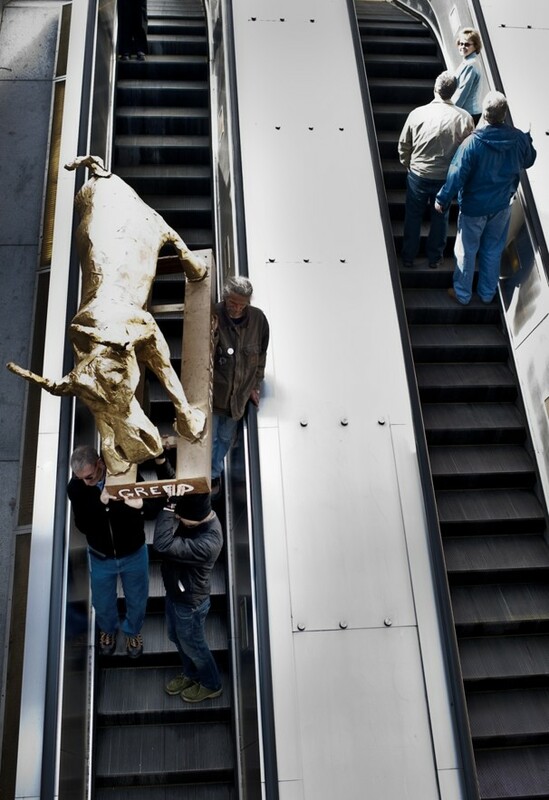 For many occupiers, the past ten years had been a time of intense darkness. A wordless despondency had crept over my generation. We watched with tears as war finally came home on September 11th, 2001. We groaned in helpless outrage as our nation’s leaders took advantage of our collective trauma and fear to invade weaker, oil-rich nations. We despaired as we saw America abandon any semblance of respect for the international community, instead striking a belligerant pose of imperial might. Though few of us could clearly articulate it at the time, we knew that this new posture represented weakness, not strength. We, the generation who had come of age at the “end of history,” were beginning to realize that history had only just begun. America would not last long as the world’s sole superpower. The economic collapse that began in the fall of 2008 confirmed our suspicions that we were nearing the end of the American Century. Yet, there was hope. With the election of Barack Obama, many of us dared to believe that America might change its trajectory. Using the economic crisis as an opportunity for spiritual growth, perhaps we could once again become a respected and respectful member of the world community. With new leadership, we could begin to address the climate crisis that threatens all of us. I personally held out hope that this new regime would focus more on education, health care and poverty reduction – rejecting the pattern of endless military build-up and systematic reduction of civil liberties established during the Bush years. After a couple of years in office, however, it was clear that Obama would not bring change we could believe in. We had been duped once again by a politician who promised a fundamental shift in our society’s way of operating. In practice, he mostly propped up entrenched elites – the financial and banking industries, the military-industrial complex, pharmaceutical companies and Big Oil. As thousands were losing their homes and poverty soared, we saw the political landscape with new eyes. We watched with disgust as virtually all of our lawmakers colluded with powerful, elite interests that ignored the needs of ordinary working Americans in favor of their own narrow interests. Many of us were becoming convinced that neither Democrats nor Republicans offered solutions for the multiple crises that we were facing as a country. All of them – Left and Right, Democrat and Republican – were more interested in the concerns of the wealthy elites than they were in the long-term health of our nation as a whole. So, when young people in New York City began to “occupy” Lower Manhattan and call for justice for the “99%,” we knew exactly what they were talking about. 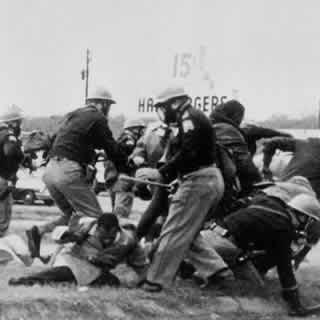 Not only did their words resonate, but we soon began to realize that public dissent and direct action were the only ways that we could exercise our civic duties as citizens. The ballot box had been reduced to a choice between Pepsi and Coke. Only the streets, parks, and public spaces of our cities remained free. It was there that we could make our voices heard and begin to take part in a real conversation about the direction of our country. In a very real sense, many of us became citizens for the first time as a result of this struggle. Always before, our voices had been confined by the straightjacket of the corporate-controlled two-party system; but now, we were free to express directly our rejection of a system that privileges the greed of the wealthiest 1% over the needs of our whole society. Though the Occupy movement initially rallied around a shared rejection of the status quo, we are quickly discovering ways that we can put forward a positive program for change. 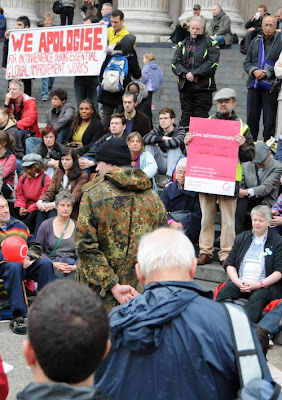 In recent months, occupiers have thrown themselves into practical, positive work for a more just society. At this early stage, foreclosure resistance figures prominently in our efforts. We seek to thwart institutionalized theft by predatory banks and to empower ordinary homeowners and renters. This is a hard struggle. There were several weeks in December where I almost completely dropped out of the movement. I had to, if I was going to retain my sanity! Everything was happening so quickly that being involved in Occupy DC meant living in a constant state of crisis. Clearly, that level of stress and anxiety is not sustainable. The first months of the Occupy movement were a process of birthing a new reality. Across the country, thousands of new activist leaders emerged in a matter of weeks. We are now discovering together what it means to live out a vocation as organizers for positive social change while maintaining our spiritual grounding and living healthy, sustainable lifestyles. Many of us are brand new to this whole activism business. All of us are learning how to be effective change-agents in this new space that has emerged as millions of Americans awaken to the urgent reality of economic injustice and ecological crisis. This movement is messy. There is so much to do, and it is easy to become overwhelmed by the immensity of the task that we have taken on. Some of the smartest, most kind-hearted people I know feel like they are in totally out of their depth. Thousands of us have been thrown fresh from college or unrelated jobs into the trenches of street organizing and grassroots activism. We were not prepared for this! But the work itself is schooling us, and as time goes on more experienced organizers are stepping up to give us the practical training that we need. The learning curve is steep, but we are climbing it. We are testing our limits and pushing our breaking points. This is just the beginning. The Occupy movement represents nothing less than the activation of the practical citizenship of my whole generation. In just a few months, Millennials have stepped out from the fearful conformity of the 2000s and are embracing our power as a generation that can make real change, now. As someone who has spent most of my adult life working under the supervision of people over fifty, it is amazing to be involved in organizations like Occupy Our Homes DC, which is made up almost entirely of people under the age of thirty-five. All of our lives, we have looked to the Boomers for direction, guidance – and permission. But in this movement, we have definitively stepped outside of the old generational hierarchy. It is a joy to see that we, the Millennial generation, are taking leadership and inviting our elders to join us in the struggle for heart-change as a society. We know that slight modifications of the present order will not be enough. We need a fundamental revisioning of our whole way of life. We must examine the ways in which our own entrenched attitudes and habits have contributed to a society in which a small elite controls most of the wealth and dominates public discourse. Now is the time to have these conversations. We have a window of opportunity to profoundly reshape our national self-understanding, to live up to America’s founding creed of liberty, justice and equal opportunity. As my generation is moves out of the trauma-induced paralysis of the 2000s, we are finding our voice as equal participants in the national conversation. I hope that elder generations will take this shift seriously. Just as the rise of the Baby Boomers in the 1960s forever altered the nature of America’s public discourse, so too will the coming of age of the Millennial generation. One thing is certain: Business will not continue as usual.